Note: Much larger version of the above collage HERE so you can see the detail. 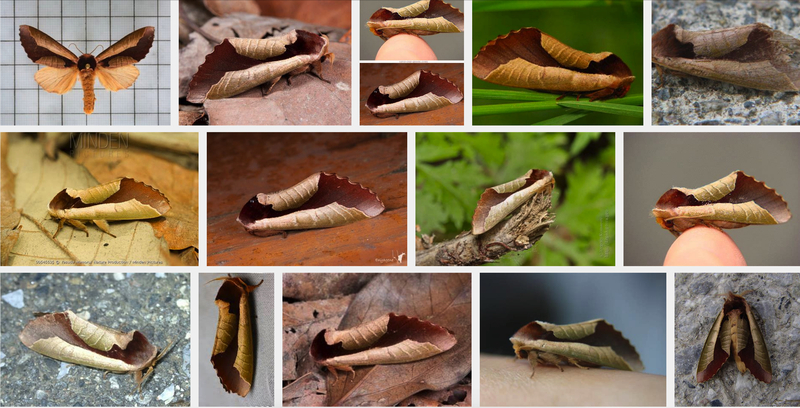 These are a bunch of shots of Uropyia meticulodina, a species of moth from southeast Asia that looks identical to a dead, dried leaf. Like the X-Men *putting on cool guy shades* it's uncanny. "Take those off." I can't, I have eye lasers like Cyclops. Still, these dead leaf moths -- evolution, am I right? "What about it?" I want twice as many fingers and a tail. Keep going for a shot of one of the moths in a museum collection for reference. Thanks to Luci, who agrees somebody is clearly trying to win the playing dead contest. I just see a toothy mouth... whelp. Every single image of one of them from the side shows the more curled wing closer to the camera. "Wait! Get my good side"
I'm always enthralled with the combination of creativity and sheer laziness pot smoking induces. I tended to own a few pipes so I never had to learn how to roll a joint and never needed to improvise smoking devices. But... I've made one-hitters out of a soda can (just roll up the can, heat it up while you're not smoking it then be gentle with the lighter when you do smoke). I also had roommates in college who were really good at rolling blunts and joints. My one favorite smoking device though... was a 1 inch socket with a screen in the bottom glued with heat-resistant glue to a piece of PVC. I think we called it the "ultimate steamroller" or something. I don't remember now. It was a good way to make yourself throw up from toking too hard though. Pretty good idea other than the scales. The anti-predator yucky scales of bad taste and texture. Nature giveth, and nature taketh away.